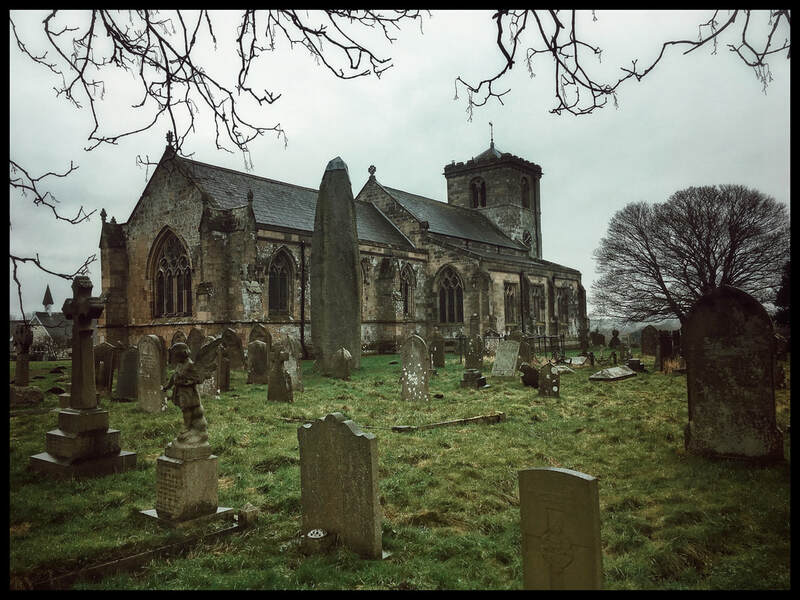 All Saints Church is nestled on a little hill in Rudston village on the Wolds. The church was built after the Norman conquest in what has now become one of the oldest inhabited villages in England. Many generations of the village have added to the adornments of the interior which are still used as part of the observances of faith. However this picturesque plot and all it contains within, are counterpoised by a foible of ancient lumpen gravitas, an old timer, a thingamabob, a gizmo so old that no one can recall what it is called or why it is there. It has been called the grandmother of the church and it is included in many books recalling it, past and present. It is generally agreed that this majestical whatchamacallit gave its name to the village. The Rudston Monolith is the largest standing stone in Britain. Taller than the Sarsen stones of Stonehenge and just as heavy. ‘Sarsen’ means ‘heathen’ or ‘pagan’. The name Rudston or ‘Rood’-Ston in Old English, meaning ‘cross’- stone may refer to its position at the junction point of a crossroads no longer visible, rather than an actual cross of consecrated stone. The name Rudston may also be from ‘Hrodr-steinn’ in Old Norse meaning ‘famous stone’. At twenty six feet and forty tons of moorland grit stone such as the kind found at Cloughton quarry, it was dragged from either Cayton Bay or an outcrop at Grosmont depending on which history book you read. Placed in this very particular position, on a prominent, at the meeting point of four equally as important ‘Cursus’ or processional roads just like the Cursus at Stonehenge. A ‘Cursus’ is currently, an unexplained and not fully understood liner feature in the landscape. A sunken road maybe, used for processional or ritual purposes, like an approach road to a stadium or a track between two arenas. superficially a Cursus looks like a deep and wide ditch, but unfathomably dating from the Neolithic 5000 years hence. The term Cursus is the archaeological label derived from Latin word for racecourse, because past archaeologists thought Neolithic cursuses were Roman athletic tracks. There are four Cursus converging on the village of Rudston which is located on a natural bend in the winterbourne stream, The Gypsey Race. The Cursus are called the Argham Cursus, Beacon Cursus, Glebe Farm Cursus and Breeze Farm Cursus. These coupled with a Henge on the northern approach to Rudston should illustrate how important this area was to the people who lived here in prehistory. “There are those who are of the opinion that this Stone was set up by the Phoenicians on their trip to England...for the Phoenicians were great builders and that the Rudston people might flatter themselves that they were once visited by the builders of Solomon’s Temple.” - A.N Cooper Secretary of the East Riding Antiquarian Society 1920. The Phoenicians, a now vanished pre-Roman civilisation in North Africa, is thought to have traded directly with Britain in prehistory before the arrival of the Romans. The name “Britain” is said to come from the Phoenician name “Baratanac”, meaning “Land of Tin”. The Greek historian Herodotus, who is the source for much of the little we know about the ancient world, describes how tin comes from the ‘lands of tin’, the trade between Britain and The Phoenicians is thought to explain how Cornish tin is found in artifacts all over Europe. A major Roman road and the remains of a Roman Villa lies outside of Rudston, suggesting the importance of the area even after the Roman conquest. Within All Saints Church in the chancel is a piscina, under which, is a foliated face or ‘green man’. Romans believed that certain places had a genius loci, a protective spirit. They felt the need to contribute their own deities and shrines to the landscape while being careful not to interfere too much with the native shrines. ‘Genius Loci’ means ‘the prevailing spirit in a place’ or ‘attendant spirit’, like a keeper or caretaker specific to a certain time and space. It has been suggested that this carving with a youthful face with foliage growing from its head, is not like anything else in the church, and is probably a reused piece of masonry from the Roman Villa and interpreted as ‘medusa’ because of the serpentine shapes of its hair. The writer John Michell in the 1970’s described Menhirs and standing stones as great nails in the ground to fasten down the magnetic energy of the Earth, which was described by 18th Century Antiquarians as otherwise chaotic and ‘serpentine’. Many old monuments from prehistory had been thought to be serpent like in design by historians such as William Stukeley and John Aubrey who had attributed this to the ‘druids’ obsession with snakes and snake like shapes and patterns, reinterpreted by John Michell as an understanding of energy patterns in flux across an undeveloped landscape. He said that this is much like the general principles of feng shui, a Chinese system of channeling energy flow, energy flow which the Chinese call ‘dragon lines’, the dragon being another type of serpent. In the chancel of All Saints Church, the face with the serpentine hair has been placed in the wall facing the Monolith through a window facing north. As part of the piscina it holds water and plays its part of in the ceremonial cleaning the objects used during service. This is Good Feng Shui.